Beat Museum, The - Beat memorabilia. Chinese Culture Center of San Francisco - A major community-based, non-profit organization established in 1965 to foster the understanding and appreciation of Chinese and Chinese American art, history, and culture in the United States. Computing History Museum - Maintains the world's largest collection of materials related to the history of computers, including hardware, software, documentation, ephemera, and media. With collecting efforts spanning four decades, the Museum seeks to preserve a comprehensive view of computing history, one that includes the machines, the software, the business and competitive environments, personal recollections, and the social implications of humankind's most important invention, the computer. Located at 1401 N. Shoreline Blvd., Mountain View CA 94043. Ph: 650-810-1010. Croatian American Cultural Center - A center to share the rich cultural heritage Croatia, the Center has become an important gathering place for enthusiasts of Croatia and other Slavic music and dance, and recent immigrants as well as long time members. Firehouse Arts Center - Pleasanton, CA. Venue providing art, music, poetry, theater, comedy, film and more. Jazz Heritage Center - Provides visitors the opportunity to experience, understand and appreciate San Francisco's unique, yet under-represented, place in the history of the American Jazz scene, and to encourage residents of the Fillmore District to recollect and enjoy their cultural and musical history. Off-site Programming Begins in Spring of 2013 - The final day of public museum operation in SFMOMA's current building will be Sunday, June 2, 2013. Throughout the approximately two-and-a-half-year span leading up to the inauguration of the new building, slated for completion in early 2016, SFMOMA will experiment with off-site programs. 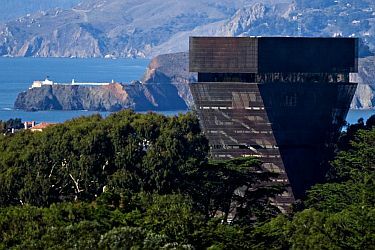 Beginning in summer 2013, SFMOMA will co-organize major exhibitions at partner museums featuring works drawn either entirely or in part from SFMOMA's holdings. SFMOMA Building Project - Mario Botta's SFMOMA building is an iconic presence within the cityscape of San Francisco. It will soon be an even more dynamic destination: SFMOMA is developing a major expansion, designed in collaboration with the architecture firm Snøhetta, to accommodate the ongoing growth of the museum's programs and audiences and to showcase the Doris and Donald Fisher Collection of contemporary art. San Francisco Public Library (SFPL) - Location: 100 Larkin, 94102; (415) 557-4400. General Collections (415) 557-4400. San Francisco History & Archives (415) 557-4567. This webpage last updated on Tuesday, June 20, 2017 9:48 AM.